Not unlike Ring Road Day One, the weather on Day Two started out chilly and wet so we bundled up again and sported our waterproof outer-layers as we set out to explore Southern Iceland. Also similar to the first day on the road, our scheduled activity (glacier hiking) was thwarted by the weather, but we had plenty of other sights we planned to see rain or shine. In fact, there were so many things we squeezed into Day Two that I had to split the blog post into two parts. 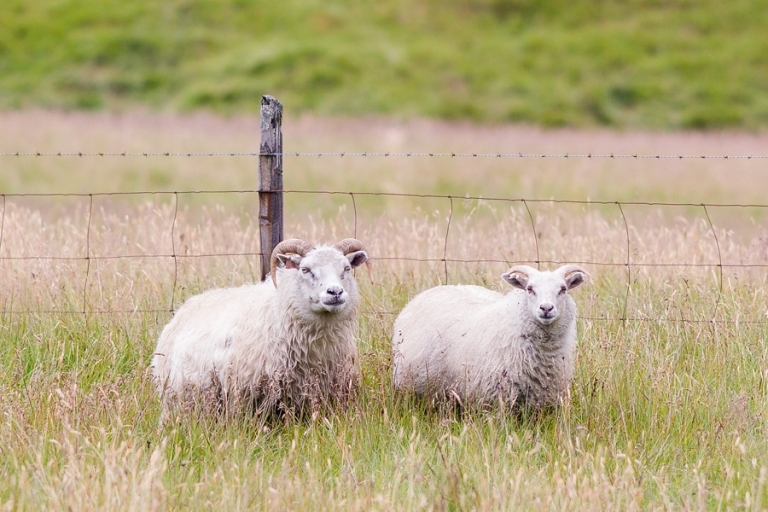 We knew to expect some dreary weather, but I admit I pouted a little bit upon waking up to a third gray day in Iceland. I suppose it was good to practice dreary-weather photography though. Sometimes it’s hard to take interesting photos when the light is completely flat and the sky adds no interest. Again, the clouds hung so low that we often couldn’t see the mountains in the background, but occasionally it added an interesting eerie effect. And this is the day that we started to see more farm animals, so of course I was excited about that! 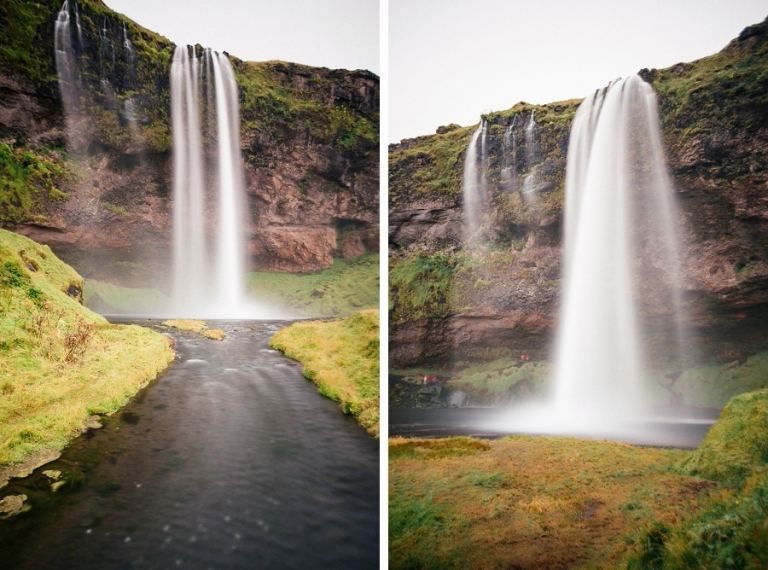 Our first stop brought us to a waterfall called Seljalandsfoss (so fun to say) fairly early in the morning, or at least early by my standards. We did beat the majority of the crowds by arriving just after 9am, but there were plenty of other photogs already there and several more were arriving with tripods in tow eager to capture the magic of the waterfall. I set up in an empty spot near a small footbridge and soon after extending my tripod legs I was joined by several other shutterbugs. I was especially excited to try out my new neutral density filter that would allow for long exposures resulting in that creamy blurred water look. I need some more practice, but I like the results! Oh, and a tip if you’re planning to visit and take photos – bring a lens cloth. Even in good weather you’ll need it to wipe mist from your lens every few minutes or so. We left Seljalandsfoss after the combination of spray from the falls and rain from the sky proved to be a little more water than I wanted on me or my camera. (I brought my camera’s Storm Jacket, but in my excitement to photograph the waterfall I forgot to take it with me.) On the way to our next spot we passed Eyjafjallajökull, but we couldn’t really see it because of the cloud cover. Am I starting to sound like a broken record yet? 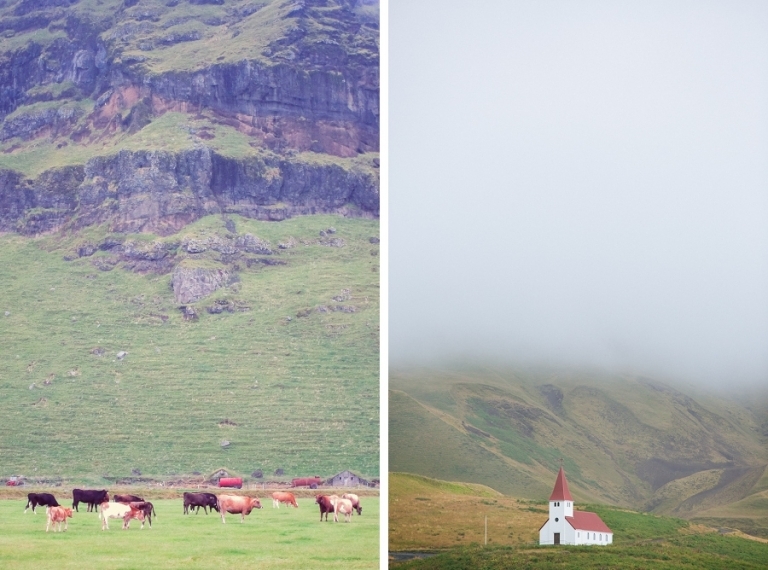 I can’t be mad at Iceland though – it’s gorgeous in even the ickiest weather. 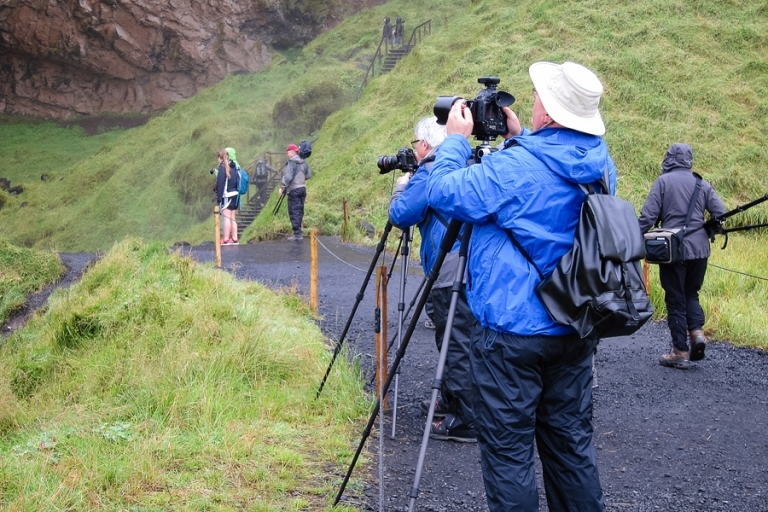 Next up, we popped by Skógafoss, but I won’t show you the image I took of the waterfall because it was still raining (the theme of our first few days) and I didn’t even get out of the car to snap the photo. Tsk, tsk – what a lazy fair weather photographer. In an attempt to get out of the rain, we decided to duck into the Skógar Folk Museum which turned out to be really interesting and cute so I’m glad we checked it out. Thankfully it stopped raining while we were inside, because a big portion of the museum is outside where visitors have the opportunity to tour the interior of actual turf houses and buildings that were moved from various settlements and reconstructed on the museum property. The photos of Chris and me standing inside the teeny dining room in one of the houses crack me up. We also saw elf houses! But no elves. Maybe they weren’t home. We decided to take advantage of the stoppage in precipitation to head to the beach! Only about 6km off of Rt. 1 just south of Vík is the Reynisfjara black sand beach where you can see some fascinating basalt column formations formed in the side of Reynisfjall mountain. I had seen photos online while planning our trip so this site was flagged in my notes as a must-see. Whether you’re into geology or not, the mountain is really impressive and the beach is beautiful so I highly recommend a visit. During the spring and summer, I think it’s also an area where you can spot Puffins (we were there after Puffin season). As a bonus, we were starting to lose the hoards of tour buses at this point on the Ring Road. This is a fairly well-known spot, but not as popular as others so the crowd was definitely thinner here. When we arrived, the temperature finally felt a little warmer and we were treated to a peek of blue skies. Just a sliver, but we were buoyed by the hint of nicer weather. I was even able to put my hood down! 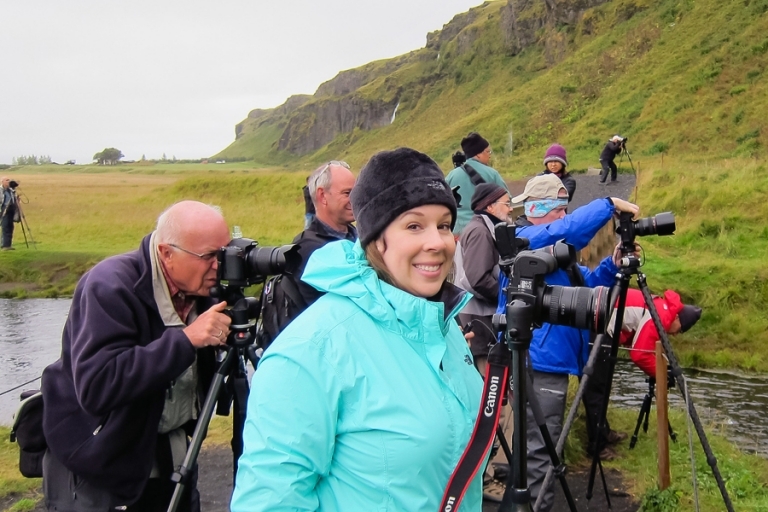 Out of all the places we planned to see, Reynisfjara was the spot where I wanted a photo of myself. I tried a selfie, but it didn’t capture the big picture of the basalt structures, so Chris took a portrait of me sitting on the columns and it’s one of my favorite photos of myself from the trip. I love the geometric pattern of the basalt, and it’s just not something we get to see every day. Our schedule was so jam-packed that day that we barely had time to stop for lunch, but we did manage to pop into a small grocery store in Vík to make a picnic lunch before heading to the spots next on our list – Fjaðrárgljúfur canyon and Jökulsárlón lagoon. More photos and stories coming up! Susan - Hi Jeanette! How awesome that you’re going to Iceland! We went the last 9 days of August. My understanding is that you can end up with gray skies at any time of the year. We only had gray skies for half the time, and the rest of the days were incredibly sunny. I hope that helps! Either way, you’ll have an amazing time!